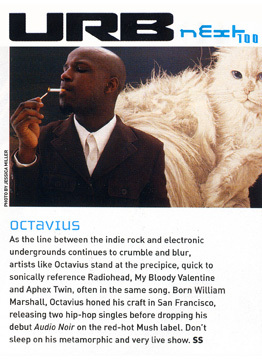 As the line between the indie rock and electronic undergrounds continues to crumble and blur, artists like Octavius stand at the precipice, quick to sonically reference, Radiohead, My Bloody Valentine and Aphex Twin, often in the same song. Born William Marshall, Octavius honed his craft in San Francisco, releasing two hip-hop singles before dropping his debut 'Audio Noir' on the red-hot Mush label. Don't sleep on his metamorphic and very live show.